How do the Ecobee3 and Ecobee3 lite compare and perform? 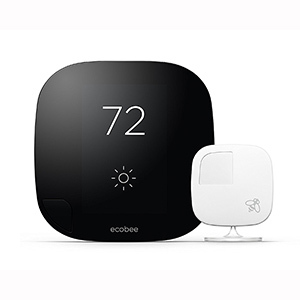 The Canadian-based Ecobee company has been selling the ecobee3 thermostat since 2014 and the ecobee3 lite since 2016. The company reports that both of these thermostats can save up to 23 percent on heating and cooling costs, and both are controllable remotely with iOS and Android devices. Read on for a detailed, side-by-side comparison of ecobee3 vs. ecobee3 lite Wi-Fi thermostats and find out which one is better for your home or business. First, let’s take a look at the basic features of each of these smart thermostats. 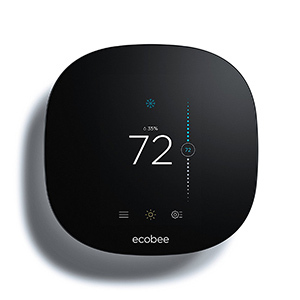 The ecobee3 was the earliest of smart thermostats produced by the ecobee company, founded in 2007. 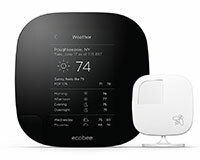 The product launched for $249 US, and while it is no longer sold directly by ecobee, it is still available through other vendors. Ecobee3 is designed to work with room sensors, overcoming some of the deficiencies of other smart thermostat manufactures when it comes to keeping indoor comfort levels optimum. Ecobee3 comes with one or more room sensors, and more can always be added later up to a total of 32. Because the sensors are placed where you want them around the house, and they monitor occupancy using motion detectors, the system can automatically control for the desired temperatures in rooms people are using. The ecobee3 lite is not an update of the ecobee3; it is more of a strip-down version more suitable for smaller spaces and faster, easier set-up. Originally, ecobee3 lite did not come with any support for room sensors. Now, the product has been redesigned to work alone or with room sensors. The main difference is ecobee3 lite does not have support for ventilation systems, humidifiers, and dehumidifiers. Room sensor compatible. Sold separately. The first generation of ecobee3 had a screen size of 3.9 inches (9.9cm) in both dimensions and a device depth of 0.9 inches (2.29 cm). However, the newer release models have increased the screen size slightly to 4 inches square (10.16 cm square), making it easier to view and control. The room sensors weigh 5.3 ounces (150 grams) and are 2.8 inches (7.1cm) deep by 5.5 (14cm) inches square. 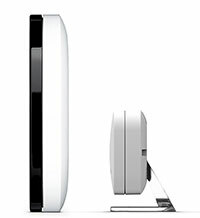 They come with brackets for setting the sensor on a flat surface, or the sensor can be mounted to the wall. The ecobee3 and ecobee3 lite and room sensors for both are the same sizes. The sleek, black interface displays the current room temperature in large numbers. Current outdoor temperatures and weather conditions are also easily viewable through the touchscreen display. The ecobee3 uses local weather information from the Internet to adjust your system to use the least energy to heat or cool your home. It can determine when to turn heating and AC off or on in advance depending on local weather conditions, so the environment is comfortable when people arrive. The ecobee3 comes with at least one room sensor, and you can add up more as you like. Some vendors offer bundle packs with the controller and three sensors. Ecobee3 supports up to 32 room sensors. The sensors use a radio frequency of 915 MHz to communicate with the control thermostat. Batteries in the sensors have a 2-year lifespan. You should know that the ecobee3 indoor temperature reading does not display the actual temperature where the device is located, but instead averages the temperature readings across all of the room sensors. The ecobee3 has three separate basic settings: Home, Away, and Sleep. Each setting can be programmed for the desired on and off temperatures for both heating and cooling, and you can adjust this for each room sensor. The system also allows you to add additional settings to match your specific needs. An additional ‘Auto’ setting allows the system to use temperatures from all sensors and combine this with outdoor weather conditions to automatically adjust the temperature settings for both heating and AC. And that’s not all: The ecobee3 can also be set to preheat or pre-cool your home before you arrive, using local weather conditions to activate heating and cooling as needed. The Ecobee 2 system also can detect the presence of people in the home and override ‘Away’ settings to provide continued comfort. You can also adjust the heat pump compressor lockout and auxiliary lockout temperatures. Being able to adjust this setting keeps the heat pump and auxiliary systems working in extremely cold weather, so this option is not as important for people living in warmer areas. Overall on the design of this product, ecobee has created a device allowing a maximum gradation of control for the end user, depending on his or her situation and needs. For those who want more information, the ecobee3 also provides optional reminders and alerts for servicing the fan, changing the filters, notifying you of abnormally high or low temperatures or extremes in humidity. The amply sized screen is helpful for accessing the extensive weather report information displayed by the thermostat. You can easily view both current and forecast information through the touchscreen interface. Ecobee3 now comes with HomeKit support. This app lets users use voice commands to connect to the system through Siri. Users can ask for information on room sensors without having to use an iPhone or another device. HomeKit uses five pre-set ‘Scenes’ for controlling voice commands for “Good morning,” “I’m leaving,” “Resume schedule,” “Goodnight”, and “I’m home” for adjusting the temperature on voice command. Essentially, this feature lets you use voice commands for selecting one of the ‘Comfort Settings’ built into the system. HomeKit remote access does not work unless you have a 3rd generation Apple TV connected to an iCloud account and your iOS device. The device also works with Amazon Echo, Vera Smart Home Systems, IFTTT, SmartThings, and Control4, but does not currently work with Google Home. The ecobee3 smart thermostat uses several pre-programmed settings, which you adjust, for controlling the temperature room by room using the sensors. ‘Smart Home’ setting makes adjustments if you are home during a scheduled away period. ‘Smart Away’ does the opposite by changing settings if you are gone when scheduled to be home. ‘Vacation’ setting keeps temperatures at a selected minimum or maximum, depending on the season, and re-sets temperatures to your comfort settings when you return home. ‘More Savings Automatically’ mode adjusts heating and cooling to the most energy-efficient levels when it detects no one is home. ‘More Control’ setting lets you see temperatures in any room using your mobile device. ‘Alerts, Reminders, and Thermal Protection’ prompt you to take care of regular maintenance such as servicing fans, changing filters, or send you a message if anything goes wrong with the system. ‘Follow Me’ setting uses motion detectors in the room sensors to adjust the temperature depending on where people are in the house. ‘Mobile Access’ setting lets you change and adjust temperatures remotely using your mobile device. These settings are optional, so you don’t have to activate them if you don’t need them. Ecobee3 is programmable to a temperature threshold of .5ºF as a default setting. This can cause the system to cycle on and off more frequently for short times. However, you can change this setting if you want to. The app contains a function called ‘System Monitor’ for viewing data for your usage. It tells you when your heating and cooling systems have been on and for how long, as well as temperature data for indoors and outside. This function also provides you with information on how your settings and scheduling are affecting your energy usage, factoring in weather conditions. You view this information on a graph comparing outdoor temperatures and HVAC usage, viewable in increments down to five minutes. You can then download the data in CSV format. One problem with ecobee3 reported by some customers is the control system reading a higher temperature than the room sensors, leading to warmer running temperature. This usually is caused by too much voltage reaching the unit through the C-wire. Ecobee now offers a remedy for this called the Power Extender Kit (PEK). This small circuit board makes the ecobee3 and ecobee3 lite compatible with HVAC systems without a C-wire. Important elements of indoor comfort and air quality are humidity and ventilation. Most people find a 40 to 50 percent humidity level the most comfortable. In some areas, humidity levels do not change as much over the course of the year, so control of humidity through the HVAC system is not crucial. In other locations, indoor air is often dry during cold weather when the HVAC system is heating and humid when AC systems are on. In this case, humidifiers and dehumidifiers make the indoor environment more comfortable and healthy. Ventilators come in two types: energy recovery ventilators (ERV) and heat recovery ventilators (HRV). An HRV recovers heat from the stale air and returns it to the fresh air in-flow. An ERV does the same but also controls moisture in the air. Ventilators move air around the building while removing odors, increasing oxygen flow, and controlling humidity. Ecobee3 is built to support one compatible humidifier, dehumidifier, or ventilator accessory. Connecting these accessories to the ecobee3 control unit involves hooking two wire to the correct terminals on the thermostat. The ecobee company website has a ‘Wiring Guide’ page showing how to make these connections. If your home or business uses a humidifier, dehumidifier, or ventilator system, the ecobee3 is the clear winner over the ecobee3 lite, which does not support these accessories. The ecobee3 uses what is known as a C-wire for connecting the unit to the HVAC system. Not all HVAC systems have a C-wire, especially older models in older homes. You can usually find out if your house has this low-voltage power wire installed by opening the cover of your existing thermostat and looking for a terminal labeled “C” with a wire connected to it. But even if you don’t have this wire, the ecobee3 comes with the Power Extender Kit. This kit is not difficult to install if you have a few basic tools and some DIY experience. Otherwise, it may be necessary to hire an HVAC technician to install the kit or run a C-wire in your house. This is usually a fairly simple and fast job. You can also go to the ecobee website and look up your HVAC system to check for compatibility, or, call ecobee customer service and talk to a technician. The software setup for the ecobee3 is guided on the screen and easy to follow. In most situations, installing and setting up the ecobee3 is as simple as selecting a location for the thermostat and mounting the unit, placing the room sensors, and following the touchscreen instructions for adjusting the settings. The ecobee3 comes with a 3-year warranty, and the product is Energy Star® Certified. The manufacturer says room sensor batteries have a four-year lifespan. Ecobee3 is no longer sold through the ecobee website, but it is still available through Amazon and other vendors. Sale price ranges from $240 to $328 US for bundles with three room sensors. Additional sensors cost between $79 and $107 for a 2-pack. There is no difference in size between the ecobee3 and ecobee3 lite. Both have touchscreens of 4 inches (10.16 cm) square. Both use the same size room sensors. The basic design of the ecobee3 lite vs. ecobee3 is the same. The touchscreen interface works just like ecobee3, and the units look very similar with ecobee3 lite having a slightly rounded appearance. Just like its earlier version, ecobee3 lite is programmable for ‘Follow Me’ settings, allowing the smart system to monitor where people are in the house and adjust heating and cooling accordingly. Ecobee3 lite has all of the other ecobee3 scheduling settings: ‘Home’, ‘Away’, ‘Vacation’ and ‘Sleep’ as well as customizable settings for fine-tuning the temperature to your exact specifications and schedule. Geofencing in another feature available in both of these products. Geofencing allows the user to set a physical boundary around their property for activating the HVAC system. When the person enters or leaves the boundary, the smart thermostat gets a message via that person’s phone app, automatically switching to the ‘I’m home’ or ‘I’m leaving’ temperature settings. Geofencing can pose problems, however, when there are multiple people in the house because it overrides information from room sensors while the person with the app is away. Ecobee3 lite also provides you with access to usage and weather information. Each month, you can access new reports showing your usage time and how much energy you have saved compared to a standard benchmark. It even tracks your total savings from the time you register your ecobee product. That’s not all: You can compare your usage data to data collected from customers all over your state and see how you match up to their usage patterns. This feature even provides a ‘Home Energy Efficiency Rating,’ telling you how efficient your home is compared to the average in your region. Ecobee uses average electricity and heating costs rates for each state and calculates efficiency against an average temperature of 72ºF (22ºC) when compiling this data. 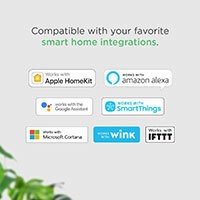 Ecobee3 lite uses the same app connectivity and voice control systems as ecobee3, and both are compatible with Amazon Alexa, Echo, and Echo Dot. Apple HomeKit support is included for integration. The ecobee3 lite has the same settings for controlling heating and cooling as ecobee3. This includes the ‘Smart Home,’ ‘Smart Away,’ ‘Vacation,’ ‘Follow Me,’ and other settings described above. The only accessory control ecobee3 lite does not have is explained below. When we compare ecobee3 and ecobee3 lite on this function, the ecobee3 is the clear winner. If your home, apartment, or business relies on these accessories, the ecobee3 lite will not control them. Most people can set-up and install the ecobee3 lite in half an hour. A simple-to-follow installation guide is provided for reading on your mobile device. Ecobee3 lite also requires a C-wire or use of the included Power Extender Kit for installation. If your house does not have a C-wire, setting up this model takes a small amount of additional time and for some people may require the help of someone with a bit of DIY experience or the help of an HVAC technician. Because many people use the ecobee3 lite without sensors, or with a minimal number of room sensors, the difference between ecobee3 lite and ecobee3 comes out in favor of the lite edition when it comes to ease of installation and set-up of these smart thermostats. Just like the ecobee3, the ecobee3 lite comes with a 3-year warranty. There is no difference between these products in this area. The ecobee3 lite is priced at approximately $169 and is available through the ecobee website and on Amazon. You can add room sensors for $79 for each pair up to a total of 32. Also, some utility districts offer energy rebates of up to $50 for installing one of these smart thermostats. Which is better when we compare ecobee3 and ecobee3 lite? Ecobee3 lite is the clear winner for anyone with a small home or open floor plan who does not need multiple room sensors. Even for homes needing only a few sensors, ecobee3 lite has almost all of the settings and features of ecobee3 for a significantly lower price. However, for anyone with a larger home or business or a situation using dehumidifiers, humidifiers, or ventilators, ecobee3 wins out because this model is the only one that can control these types of accessories. If you like article, please rate it.